American Impressionist Child Hassam painted numerous patriotic views of New York's Fifth Avenue. Metropolitan Museum. In many ways 1918 is closer to us than we are inclined to think. Look at Fifth Avenue in New York (or Regent Street in London, or the Champs-Elysées). Many of their present buildings were there a century ago. Automobiles, telephones, elevators, electric power, electric lights, specks of droning airplanes in the sky—there they were in 1918. Now count back a hundred years from 1918. That was 1818, when just about everything looked different. Everything was different: the cities, their buildings, the lives of the men and women outside and inside their houses, as well as the furniture of their minds. But many of the ideas current in 1918 are still current today: Making the World Safe for Democracy; the Self-Determination of Peoples; the Emancipation of Women; International Organizations; a World Community of Nations; “Progress.” The twentieth century was a short century, having burst forth in 1914, formed and marked by two world wars and the Cold War, ending in 1989. In many ways 1918 is farther from us than we are inclined to think. 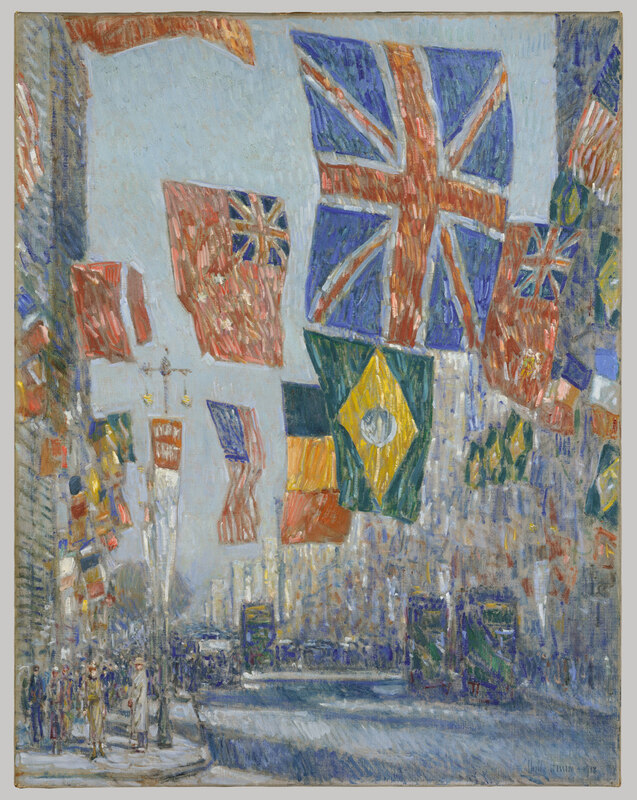 After taking comfort—and, more important, pleasure—from a picture of Fifth Avenue in 1918 (I am thinking of that splendid painting by Childe Hassam, with all those Allied flags waving, dramatic poppies in a wheat-colored field of sun-bleached architecture), look closer; lean downward; try to look inside. The people are different from us, and I do not mean only the difference of two or three generations: They look different, because their composition and their clothes and their manners and their attitudes and aspirations are different. So are the interiors of those still-standing buildings, what there is and what goes on inside them: their furnishings, in most cases not only their inhabitants but the functions of their rooms. Yes, Fifth Avenue is different, New York is different, America is different, the world is different. The twentieth century is gone. It was in many ways the American century. In 1898 the United States became a world power—not because of some kind of geopolitical constellation, not because of the size of its armed forces, but because that was what the American government and the majority of the American people wanted. Before 1898 the United States was the greatest power in the Western Hemisphere. Twenty years later the United States chose to enter the greatest of European wars (the very term world war was an American invention, circa 1915). In 1918 it decided the outcome of the war. By Armistice Day the United States was more than a World Power; it was the greatest power in the world. 1918 was perhaps the greatest turning point in American history. Before, we had looked westward. Now it was the American Century. That was more than a milestone in the history of the United States. It was a turning point: the greatest turning point in its history since the Civil War and perhaps the greatest turning point since its very establishment. For more than three centuries the colonists and Americans were moving westward, away from Europe. The trickle, and later the flow, of immigrants moved westward too, across the Atlantic, away from Europe. When foreign armies crossed the Atlantic, it was westward, from the Old World to the New. Now, for the first time in history, this was reversed. Two million American soldiers were sent eastward through the Atlantic, to help decide a great war in Europe. That was an event far more important—and decisive—than was the Russian Revolution in 1917, both in the short and in the long run. In early 1918 Russia dropped out of the war. The United States entered it. Russia abandoned its European allies. The United States came in to join them. In 1918 the Allies were able to defeat Germany and win the war, even without Russia (something that would not be possible in another world war). The presence of an American army on the battlefield proved to be more decisive than the absence of the Russians. In the long run, too, the twentieth century turned out to be the American century, on all levels, ranging from world politics to popular democracy and mass culture. Compared with this, the influence of communism and the emulation of the Soviet Union were minimal. The exaggeration of the importance of communism blinded, willfully, not only many intellectuals but many Americans, pro-Communists and anti-Communists, developing into a popular ideological view of the world. In 1967 I was astonished to find how here, in America, article after article, book after book was devoted to commemorating and analyzing the importance of the Russian Communist Revolution on its fiftieth anniversary, while hardly any notice was paid to the commemoration of the American entry into World War I in 1917. For a long time Americans believed that the destiny of their country was to differ from the Old World. Beginning in the 1890s, and culminating in 1918, this fundamental creed changed subtly. Many Americans were now inclined to believe that it was the destiny of the United States to provide a model for the Old World. For a while these two essentially contradictory beliefs resided together in many American minds. In 1918 the second belief had temporarily overcome the first. This was the result of a revolution of American attitudes that—on the popular, rather than on the political, level—still awaits a profound treatment by a masterful historian. In 1914 not one American in a thousand thought that the United States would, or should, intervene in the great European war. In less than three years that changed. By 1917 most Americans were willing—and many were eager—to go Over There, to decide and win a war through the employment of American muscle, American practices, American ideas. After that the tide of American confidence rose, and in November 1918 came the moment of victory. All over the world, but especially in Europe, admiration and gratitude and hope in the United States were suddenly at their zenith—a powerful ray of a faraway sunbeam breaking through those grayest of leaden skies in November 1918. Unlike after 1945, there was no trace of radical, or intellectual, anti-Americanism. The youngest and one of the most promising and most avant-garde of French writers, Raymond Radiguet, wrote about a romantic rendezvous in the spring of 1917 in “an American Bar in the rue Daunou.” His lover “went into ecstasies, like a schoolgirl, over the barman’s white jacket, the grace with which he shook the silver goblets and the poetic and bizarre names of the concoctions.” An old goateed French academician, Henri Lavedan, wrote about President Wilson, “He will remain one of the legends of history … he will appear in the poetry of coming ages, like that Dante whom he resembles in profile.” Lavedan needed better glasses than his pince-nez, but that is beside the point. “Future generations will see him guiding through the dangers of the infernal world that white-robed Beatrice whom we call Peace. …” Whether Dante or Beatrice, when Woodrow Wilson landed in France, little girls in white frocks threw rose petals from baskets at his large feet. Harold Nicolson, then a young British diplomat and budding aesthete, had the highest hopes for Wilson and his new ideas—although they would vanish soon. The hope that Wilson and the United States would dominate and design the coming settlement of peace, with principles vastly superior to the petty and vengeful practices of European statesmanship in the past, existed not only in France and Britain but also in Germany, Austria, Hungary. In Vienna and Budapest governments and peoples welcomed the presence of American officers, members of the Allied military missions, some of whom were to distinguish themselves by their impartiality and humaneness. A great Hungarian writer, Gyula Krúdy, found it remarkable how the hapless and ephemeral president of the new Hungarian Republic, Count Károlyi, kept pronouncing—oddly—Wilson’s name to his anxious entourage, again and again: “Uilson! Uilson! ” Of all the foreign officers, the Americans were the smartest, in their well-cut uniforms, with their Sam Browne belts and superb boots. In France a war-worn, tired population had thronged the streets when the first American troops, fresh, grinning, confident, arrived in their villages and towns. They looked modern. They were modern—a wondrous adjective then, though it has lost much of its shine since. Soon the high tide of enthusiasm receded—and the neap tide of disillusion came in: disillusion with Wilson abroad, disillusion among Americans themselves. The reaction to the war, to peacemaking, to Wilsonianism has been recorded often since. Even about 1918 some questions remain. Was the American intervention decisive? Yes, but the British and the French armies, weary and torn as they were, had halted the great German spring offensive by June 1918, before the mass of the Americans moved up to combat. The training and the transporting and the provisioning and the disposition of the American army had taken very long—almost too long. They did not go into battle until about fifteen months after the American declaration of war. It is arguable that their first great battle in Belleau Wood may have been a mistake, costing too many American lives, misestimating its tactical value. General Pershing had virtues, but he was not a great general, occasionally hardly better than some of his British colleagues, whose generalship was often famously poor. Still—the freshness and the courage of the American soldier in 1918 remain unarguable. The trouble was with their President, about whom his Postmaster General once wrote that Woodrow Wilson was “a man of high ideals but no principles.” That, too, is arguable, but then so many of his ideals were to be proved wrong—again, in both the short and the long runs. In the short run—that is, 1918 and 1919—during that extraordinary chapter in the history of the American Presidency, his absence from Washington for long months in Paris showed up many of his weaknesses. “Open diplomacy” was one thing that men such as Harold Nicolson admired, but Nicholson was abashed to learn that there was no such thing in Paris. Before Versailles Wilson made compromise after compromise involving his principles or his ideas, whatever we call them. He was no match for Clemenceau or Lloyd George, and the result was one of the worst botched peace treaties in modern history. As Chesterson once wrote, the best things are lost in victory and not in defeat. That would dawn on the American people only later. That was not why their elected representatives repudiated him in late 1919 and 1920. But Wilson’s failure to bring the United States into the League of Nations was not that important in the long run. Had he had his way at home, had the United States entered the League, it would have made some difference, but not much. The source of the Second World War (and of Adolf Hitler’s career) was not American nonparticipation in the League of Nations. It was Versailles, for which Wilson was as responsible as for the former. He also bequeathed to the American people a philosophy of internationalism (enthusiastically espoused by such different Americans as Herbert Hoover and Eleanor Roosevelt, Richard Nixon and Dean Rusk, Jimmy Carter and Ronald Reagan) that, because of its legalistic (and therefore insubstantial) moralism, including its promotion of National Self-Determination, has been rather disastrous. But that is another story. One year after the armistice, American influence in Europe was receding fast. Within the United States, too, a great national hangover set in—in part a reaction to some of the exaggerations and fever of the earlier war propaganda. It was a return of sorts—but neither to innocence nor to “normalcy” (a word coined by Warren Gamaliel Harding). There followed a decade or more of American isolationism (in regard to Europe, though not to the Caribbean or the Pacific), together with the self-righteous belief, expressed in one of Barton W. Currie’s editorials in The Ladies’ Home Journal : “There is only one first-class civilization in the world today. It’s right here in the United States. … Europe is hardly second-class.” For the first time in American history a very restrictive Immigration Act was passed. It had something to do with the obsession with communism (from which the Republican party knew how to profit, from Harding to Reagan), though there was more to it. Many people, too, forgot that while one out of every one thousand Americans died in World War I, thirty-five of every one thousand Frenchmen died. The French did not forget. Those memories maimed them. They fell out of World War II in the summer of 1940. Soon after that Americans were beginning to ready themselves to enter it and to help liberate France again. Which was the zenith year of the American century, 1918 or 1945? This brings me to a last question that I, and presumably many others, have pondered often. Which was the zenith year of the American century, 1918 or 1945? Perhaps it was 1918—when the United States did not have to share the victory with Russia (although it had to share it with Britain and France, Italy, Japan). Perhaps it was 1945—when the United States, alone among the Great Powers, could wage a war on two vast fronts and conclude it victoriously, across the Atlantic and Pacific alike. In 1918 the Western democracies had all the cards—the ace, the king, the queen, and the jack, with Germany defeated and Russia down and out. In 1945 the United States had the ace (and what an ace! ), but Stalin had at least the king. Yet in 1918 America and its Allies played their cards badly and lost the peace almost immediately afterward. In 1945 they let Stalin cash in his winnings, but further than that they did not let him go. The world order (or disorder) shaping up in 1945 was more lasting than that in 1918. The effect of World War II was greater. It transformed the structure of American government and much of American life. A few years after 1918 the American military presence in Europe was gone. After 1945 it remained there. No American general of World War I became a permanent national figure or President. After World War II there was Eisenhower—and also Patton and MacArthur and Kennedy and Bush, whose impressive war records helped form their popular images. Yet there was more enthusiasm in 1918 than in 1945. There was no popular song in World War II comparable to “Over There.” Sergeant York was a real soldier, unlike John Wayne. Harry Truman fought in the Argonne, not in Hollywood. Perhaps, if only for a moment, 1918 may have been the highest point, with all of that new American presence in Europe, with all of those great expectations. And now, a hundred years later, the United States is the only superpower left in the world, but everything else is different.